The only thing this Inn Overlooks is the Water! A delightful waterside Bed and Breakfast, the Inn at Harbor Hill Marina, nestled in the marina district, overlooks the picturesque Niantic River and Long Island Sound. 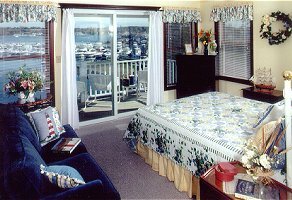 The Inn boasts eight tastefully decorated guest rooms, all with waterviews, CA/TV, A/C and private baths, some with balcony. 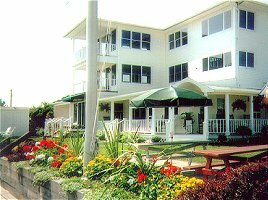 Continental breakfast can be enjoyed on the wraparound porch overlooking the marina and flower gardens or by the fireplace in the cozy Bayview Room. Rates range from $90 to $195. Take one of our Kayaks for a scenic ride down the Niantic River, visit our local beaches or walk to restaurants, shops and antiques. Just a short drive to Mystic Seaport and Aquarium, Foxwoods and Mohegan Sun's Casino, Wineries, Summer Concerts, Outlet Malls, Museums, Fishing Charters, Essex Steam Train. and Riverboat, Antique Shops and Golf. So much to do and see any time of year! You won't be disappointed. This and other Niantic Bed and Breakfast Inns can be found here in The Register. Romantic Country Inns, Getaways and B&Bs offer a great Mystic lodging alternative to big hotels.